By Kori ~ September 6th, 2012. Would you like a quick suggestion for a good wine to drink tonight (or this weekend) that wonâ€™t break your budget and is widely available? 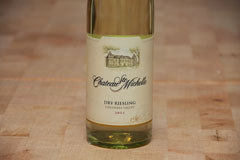 Many of our readers have said this is something they would like, so here is this weekâ€™s selection, the 2011 Chateau Ste. Michelle Dry Riesling from the Columbia Valley in Washington State. Washington is the largest Riesling producing state in the United States. And, Washington Stateâ€™s own Chateau Ste. Michelle is the largest Riesling producer in the world. Chateau Ste. Michelle is Washington Stateâ€™s founding winery with its roots dating back to the repeal of Prohibition. In 1976, Ste. Michelle built a French-style chateau in Woodinville, just northeast of Seattle. While all of Chateau Ste. Michelleâ€™s vineyards are located on the east side of the Cascade Mountains, all of their white wines, including this Dry Riesling, are made in Woodinville. I agree, Wine Peeps. This is one of the great bargains in the wine world. I remember when it was tasted at Riesling Rendezvous. The elite international crowd gave a spontaneous standing ovation when Wendy told them that it sold for about $8 (or less than $6 at the right time and place). Bravo CSM! Thanks, Mike. I, too, remember the standing ovation that Wendy received at Riesling Rendezvous. Well deserved! This wine definitely delivers serious bang-for-your-buck and has become a “house” favorite of ours. Cheers!